Whilst we all enjoy the thrill and exhilaration of riding, we participate in our sport knowing that there’s also an inherent risk of injury. And whilst this may not trouble many riders on a daily basis, when we do occasionally fall or have an accident, it can feel like a real setback, both physically and mentally. It’s easy for other people to say “just get back on” but the barriers to carrying on riding exactly as you did before can feel insurmountable, impossible to overcome. But it doesn’t have to be that way. Because when you are mindful of the key steps, you can achieve a complete recovery. 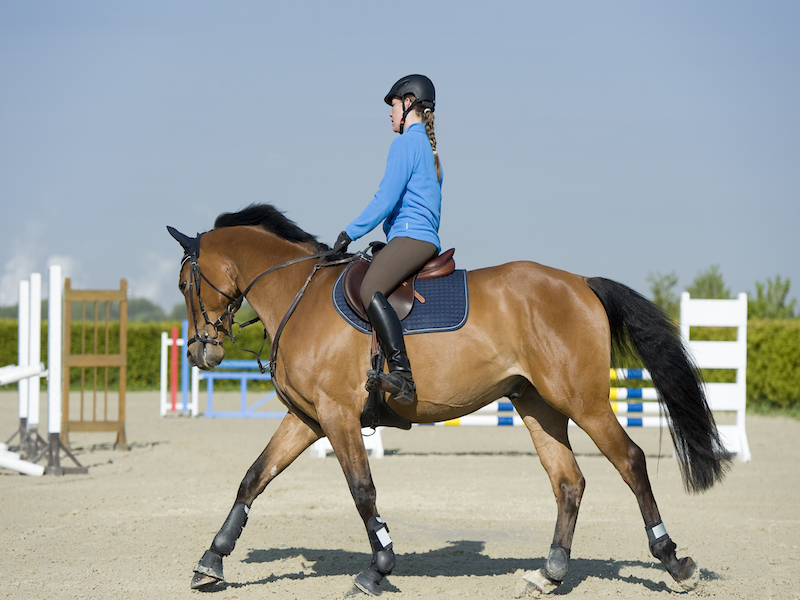 These steps are often not acknowledged, either because riders feel overwhelmed following a fall or accident or because their focus is simply on getting back on as quickly as possible. But when you focus on each of these steps, you’ll find it much simpler to recover fully from your fall and you’ll be able to return to riding and competing confidently much more quickly. When I work with riders to help them overcome an accident, my focus is on helping them recover mentally and rebuild their confidence. However, there is a step before that can happen. Physical recovery is crucial particularly after a serious fall. Our brains are programmed for survival, to keep us safe. When you are physically injured, you become more risk sensitive, which is your brain’s way of keeping you away from any activity that puts our weakened bodies at risk. So it’s very common for riders to believe that they have suffered a total loss of confidence at this stage of recovery. Until you have physically recovered from a fall, it’s difficult to assess the extent of the impact on your confidence. So initially, the best use of your energy and focus after a fall is to achieve physical recovery. Regain as much strength as possible physically and this will help you start to regain mental strength. Often the memory of a fall replays in riders’ minds over and over again. Even though the incident has passed, the trauma of it often remains and you end up re-living it over and over again. The memory has such power it can recreate all the emotions you felt at the time of your fall, which prevents you from being able to move on from it. The reason this happens is because we are born with a fear of falling. So any time you fall and get hurt, it’s normal to feel anxious or fearful about falling again. However, although there is a positive intention behind this – to keep us safe – worrying about falling is damaging to your confidence and focus. It creates negative thinking, anxiety about ‘what if’ scenarios and makes you more focused on what could go wrong which makes those negative outcomes more likely. The first step to mental recovery is to be kind to yourself. It’s OK to be worried about getting back on. It’s OK to feel like you need to take your time and take small steps. Ignore anyone who tells you that you’re not brave. You’re brave because you had a fall, got hurt, and now you’re working out how to get back riding again. Remember bravery isn’t about being reckless. It’s about staying safe whilst being courageous. And the way to do that is to take small positive steps! When I work with riders who are struggling to overcome the memory of their fall, simply talking about what happened can trigger feelings of anxiety, panic and overwhelm. And all the time that this trigger remains, it prevents riders from achieving mental recovery and returning to riding how they used to before their accident. The key to dealing with this memory is to take the power out of it. There’s no simple way to do this on your own, however, it can be overcome in a rider psychology session using techniques from Neuro-Linguistic Programming (NLP) to restructure the memory so it no longer triggers anxiety, stress or panic. It becomes a neutral memory – one that you can remember but does not create any negative feelings. So it becomes less important and you stop thinking about it so it occupies your thoughts less and less. And this changes your focus, creating mental space and capacity for you to rebuild your confidence, which is the third and final step to full recovery. Once you are certain that the memory of your accident is no longer triggering anxiety, then you are ready to focus on rebuilding your confidence. When I work with riders on this third and final step, it either follows a session where we deal with the memory of the accident or the rider I’m working with does not have an issue with the memory of their accident. It is therefore critical to only work on this third step at the point where you are certain that the memory of your fall is not triggering anxiety, stress or panic. The first step to rebuilding your confidence is to start building positive focus. This can be as simple as writing a plan for getting back on your horse and slowly returning to doing all the activities you were doing before. Or you can start focusing on some short term goals – what would success look like for you in the next month? What will you be doing with your horse? What would be the best thing about achieving that? Positive focus and confidence go hand in hand. The more you focus positively on the progress you’re making, the more confident you’ll become. And it doesn’t matter if the steps are small and seem insignificant. They are indicators of positive progress, moving forward again, and that’s what matters most. Anything that takes you forward, away from your current situation and towards riding confidently again, is something to be celebrated. If you’d like to find out more about rider sports psychology and how Helen can help you overcome a fall or accident, then you can book an initial consultation here or contact Helen here.